Special Message Concerning Bhagawan's Health by Dr. Goldstein - Posted on April 8, 2011 at 11:00 p.m.
Dr. Michael Goldstein, is the Chairman, Sri Sathya Sai World Foundation, as well as the Chairman, Prashanthi Council – the international body that oversees the activities of Sri Sathya Sai Organisations worldwide. 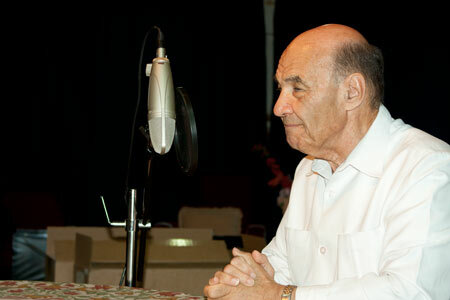 This is the transcript of the message Dr. Goldstein recorded in the studio of Radio Sai for the benefit of all listeners on April 8, 2011. With humility and love I offer my pranams at the Divine Lotus Feet of Bhagawan Sri Sathya Sai Baba. Bhagawan Baba, our Beloved Swami as we refer to Him, is, and always has been, in control of the human life that He has assumed. He is, and has always been, in control of His own destiny in this life that He Himself ordained to take place for the benefit of mankind. We, who are devoted to Him, pray that He will decide to recover and remain amongst us. We pray that He will continue to teach us, inspire us, bless us, and love us as the Divine Mother and Father that He is and has always been. We pray that He will enable all of mankind to accomplish the inevitable spiritual journey that awaits each and every one of us, the journey towards enlightenment and self realization. This last November, the President and Prime Minister of India visited Bhagawan Baba on the occasion of His 85th Birthday. They acknowledged and paid homage to the monumental and unprecedented humanitarian accomplishments and services rendered by Baba over many decades. Free schools, primary through University level, providing high quality worldly education and unprecedented spiritual education, incorporating the universal human values: Right conduct, Truth, Peace, Love, and Non-violence, into the curriculum at all levels. Who has ever done such a thing? Free medical services in mobile hospitals, general hospitals, and super-specialty hospitals where the poor are treated for ordinary maladies as well as complicated medical diagnostic evaluations, treatments, and surgery. All free of charge. Conceiving and building a system of reservoirs, overhead tanks, wells, and thousands of miles of pipes conducting pure water to millions of poor people at no cost to the people or the government. Most noteworthy and awe inspiring, is the following of kindred hearts, the procession of human goodness and selfless love, the good people who have joined together to follow Him. They imbibe His Divine Teachings and emulate the noble examples that He has demonstrated. Over the years, people from many countries, who had a dream, or a feeling, or a thought, or heard a voice, or read a book, were all suddenly inspired to act and become His devotees. There was no solicitation, advertisement, or campaign. There was no telephone call or written invitation. They received the message promulgated by the Divine One, our Beloved Baba, heart to heart. There are hundreds of thousands of devotees all over the world, perhaps millions of good hearted people, finding the light of His love deep in their own hearts, transforming their lives into beacons of virtue. Now, He, who has been the veritable source of goodness and godliness, who has taught and sacrificed for the people, who has taken upon Himself a serious illness, is being falsely maligned in some quarters. A litany of old, scandalous accusations, proven false repeatedly over the years, is being published irresponsibly. Multitudes of tender hearts suffer as a result of this callousness. I am hopeful that noble minded journalists will seek, find, and write about the “greatest story ever told”. They will seek the truth and humanity will be served. They will find the truth in the lessons taught by our Beloved Baba to mankind through His Words and His Works over many decades. They will find lessons for the spiritual redemption of mankind. Let us pray that Bhagawan Sri Sathya Sai Baba will decide to remain with us for the salvation of all. As He has taught, and may we all experience, that everyone of us are children of God. We are all essentially divine. Let each of us turn inwardly, find the light of selfless love - the light that enlightens. May each of us ultimately become the noble beings that we truly are and behave accordingly. Let us all pray that Swami will hasten His recovery and move amongst us once again.